In the 21st century, education presents unprecedented challenges and new opportunities for learning with technology. The mission of the World Wide Workshop is to harness new technologies to help children develop their curiosity, express themselves creatively, and communicate globally through a personalized and active process. 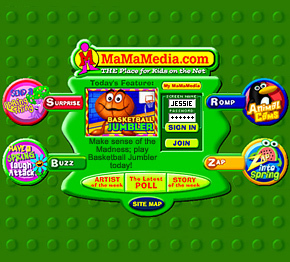 MaMaMedia.com is an example of a large and diverse application for playful learning with Internet technology. Children are challenged to create digital media, explore and express themselves online. Learning.MaMaMedia.com includes Lesson Plans developed by the MaMaMedia educational alliance with teachers. 21st Century Learning is a series of articles written for today's parents and educators, exploring ideas about parenting with the Internet, and the convergence of kids, technology, and learning. A key mission of the Worldwide Workshop is to communicate with children (both online and offline) about the technology that has become part of their everyday lives, and how its influence on youth, families, friends, athletes, artists, students, and global citizens. Kids expect to see, hear, and read about technology at the movies, on television, on the radio, and in print. It's all part of kids' culture! 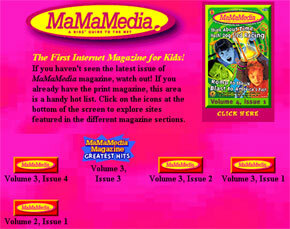 MaMaMedia - A Kids' Guide to the Net, is a 20-page, 4-color quarterly magazine. Was the first of its kind when launched in 1996, and still is the only print publication about the Internet-fully dedicated to kids. Published during 1996-2000, it reached over 1 million readers and introduced children and parents to the culture, technology, and language of new media and the Web, and recommended the best places on the Internet.